(CNN) – The last two Republican presidential nominees were reunited this weekend to celebrate the wedding of Sen. John McCain's son, a Navy helicopter pilot, in San Francisco. Jack McCain married Renee Swift, who herself is an Air Force Reserve captain, on Saturday. The night before, Romney was pictured alongside McCain's daughter Meghan at the rehearsal dinner, looking relaxed in a wooden bead necklace and a shirt adorned with hula dancers. Sen. McCain also tweeted pictures from the wedding itself, including a group shot with the bride and groom alongside three of McCain's other children. Wonderful day at my son Jack's wedding! On Friday, Ann Romney said in an interview her husband was enjoying his time out of the spotlight by writing and travelling. "I've been doing what I've been dying to do for a very long time which is ride a lot and I've been competing a lot and showing a lot and Mitt's been there supporting me and coming with me and watching me and helping me," Mrs. Romney said on "CBS This Morning." 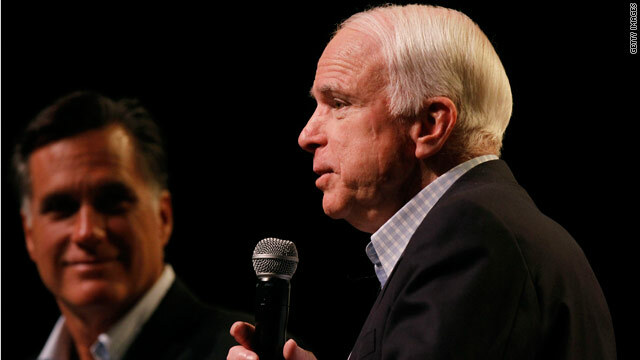 McCain, the 2008 Republican pick for president, backed Romney early in the 2012 nominating process. Don't care. This is not political news. It is a "human interest" and "entertainment/celebrities" story that belongs on those parts of the website. This story should be on TMZ, not here. Is this a part of the NEWS??? Pathetic. If you do not have ny news, just put some photographs from Newzealand and north Carolina Beaches. Why is Cindy wearing curtains? I hope the kid is a better pilot than his dad ... John McCain crashed 2 planes (one due to pilot error) before being shot down over Viet Nam. Wow, the kid's marrying an African-American woman ... that must be making right-wing heads explode all OVER the place!